As an integral component of numerous organizations’ safety and security priorities, video surveillance has demonstrated its value and benefits numerous times by providing real-time monitoring of assets, property, environment and people. As security risks increase, the need to visually monitor and record events in the most remote areas becomes even greater. Moreover, the value of video surveillance has grown significantly with the introduction of intelligent motion, temperature and sound sensors. Intelligent sensors, combined with video analytics, bring forth the newest generation of powerful digital security systems for the post-Sept. 11, 2001, era. Integrated video, analytics and sensors help authorities make better decisions and drastically improve response times. As security equipment moves away from closed analog systems to open digital systems using IP, the network that connects all aspects of the system becomes critical. A network-based security system is only as good as the network that connects it, to share and relay time-sensitive security information between each functional component. As the IP standard develops, security professionals face many choices in cost-effective reliable transmission medium for their security system. Fiber optics, Ethernet cabling and wireless methods are among the most widely used. Wireless networks, overlooked in the past because of a reputation for poor performance and reliability, have become accepted as an option. In many remote security applications, it is the only option. 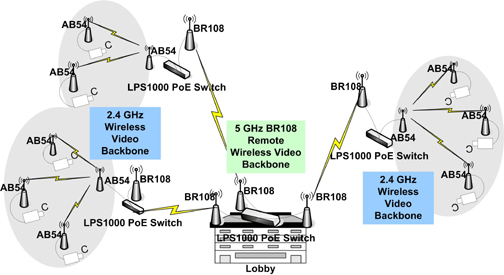 IP video, also known as networked video, over a wireless medium is not a new concept. With the industry boom in unlicensed WiFi and fixed wireless broadband, economies of scale in these 802.11-based hardware has led to less expensive, more rugged outdoor and long-range radios. Saving money and lowering project cost is perhaps the largest benefit of deploying a license-free wireless video network. Lower cost barriers allow security professionals to place cameras in areas that are difficult or impossible to hardwire. Faster deployment is another benefit. Security professionals can tackle large outdoor video surveillance projects in shorter project lifecycles, creating a faster return on investment and a more satisfied customer. Wireless IP networks provide more flexibility and scale compared to other video surveillance network transport media. They make temporary surveillance applications possible because they easily can be uninstalled from one location and reinstalled at a new site. From construction sites to public safety at seasonal city events, wireless video surveillance networks have demonstrated value by lowering crime. The flexibility of wireless networks for security applications opens more remote security and many other applications once too costly to even consider. There remain a number of myths about wireless communication, fueled in part by experience with analog systems. The first myth is that wireless is unreliable and complicated. The truth is, digital wireless video links, when deployed correctly, can offer reliability equivalent to or exceeding wired installations. Wired installations are prone to cable or interface corrosion and disturbances and are costly to replace. Wireless video links have the added feature of link redundancy, base station failover and testing, and experience has demonstrated reliability of 99.9999 percent. Radio transceivers operate in point-to-multipoint mode, allowing a single base station to communicate with multiple wireless transceivers. That makes adding new camera nodes to a wireless surveillance network as simple as adding a new wireless transceiver and video camera system. With access to more than 20 MB of bandwidth on an 802.11g wireless transmission link and 50 MB on an 802.11a link, a wireless video network can scale to accommodate large outdoor camera systems reliably. With the onset of the IEEE 802.11n draft standard, wireless medium capacity may reach 150 MB or more and is a cost-effective alternative to hardware wiring. Table 1 compares open IP standard and its video camera capacity. Another myth is that wireless is insecure. True, the wireless encryption protocol used on the first-generation digital wireless LAN networks was easily defeated. But that was more than 10 years ago. The latest software tools and wireless sniffers are able to derive the network key within just minutes of sampling a communication link. Newer outdoor wireless video transceivers use chipset technology with strengthened security. Advance encryption is a standard feature on all IEEE 802.11a and 802.11g digital transceivers from Inscape Data. AES is a standard recognized by the government for transmittal of classified information. AES is the highest level of wireless encryption available to the public. The most significant advantage of AES is that every time data is sent it is encrypted with a unique key. Breaking AES encryption is almost impossible, but according to industry experts, the time required to break WEP is less than 10 minutes. Table 2 compares three of the most common wireless encryption method based on worldwide installed user base. Wireless encryption based on AES is secure not only for video applications but also for corporate and government use. AES accommodates 128-bit, 192-bit or 256-bit keys. To obtain the most benefit out of wireless video deployment, end users must understand the challenges that come with a successful deployment. Equipped with wireless fundamentals, overcoming wireless obstacles and maximizing available bandwidth are keys to a successful deployment. Wireless signals are invisible. Making them visible enough to manipulate requires learning and practice. Wireless signals spread out and get weaker as they leave the antenna. They lose significant strength when they encounter with an obstacle or reflect off the ground, bodies of water or a building. A wireless signal operates optimally line of sight on the same channel between two base stations. This configuration, however, lowers overall wireless network capacity, which means it accommodates fewer cameras. One of the common mistakes of outdoor wireless video network deployment is the default use of omni-directional antennas. Omni-directional antennae radiate wireless signals in all directions and are ideal for maximizing a coverage area. However, since antennas also function as a receiver, they will pick up noise and potential interference from all directions as well. Care should be taken when selecting the type of antenna. Many systems are designed with a mix of directional and omni-directional antennas; each affects the signal. Radio engineers work with “link budgets,” which measure both the capacity and strength of a radio link and the amount of degradation it can sustain before complete loss of signal. Remote wireless video surveillance for distances beyond a few miles is also possible with unlicensed wireless. Long-range remote wireless video surveillance makes it possible to centralize video surveillance from several remote areas. In parts of the world, base stations can use solar power. This allows deployment of video surveillance cameras almost anywhere. Armed with wireless fundamental knowledge and deployment confidence, numerous application possibilities are brought fourth by long-range digital wireless transceivers. The commercial parking lot video surveillance project once thought too costly may be revisited. Border and port protection projects become more manageable. Wireless networking for the security sector is not limited to video surveillance. Wireless access control also is gaining popularity. Increasing use of wireless for access control has been driven by the same factors as video. Users want access control systems to transmit video, voice, relays and sensors from remote stations to a master station economically and reliably. Unlicensed wireless systems allow access control applications to manage hundreds of entrances or gates across several campuses from a single location without dedicated hardwiring. If the savings derived from no wiring and speedy deployment is still not enough, consider the savings from the non-recurring cost of remote access control or video surveillance. Traditional hard wire remote options require leased T1, fiber or DSL lines. With wireless there is network ownership and no inherent recurring monthly cost to operate. Network-centric video surveillance will continue to evolve. Remote surveillance applications will become more integral to an organization’s video surveillance roadmap. As digital IP-based security technology advances, the use of reliable IP wireless products will continue to increase, shifting from a functional role of branch network for few remote video surveillance cameras to providing the video surveillance backhaul between campuses or remote locations.